I've read a few parenting books in my day. To be honest, they generally exhaust me. I'm either all "Blah, blah, blah...theory blah...blah." All the theory which makes me want to scream--"Quit cramming scientific theory into my tired brain, just give me the simple steps to follow for greatness." OR, I'm left feeling as though I've completely messed things up and I better start contributing to a therapy fund instead of a college fund. Yet, two books stand out. The only two books that I've read on parenting in the last few years. Because I'm over here all busy with on-the-job training. These two books are easy reads and ones I highly recommend for every parental, potential parental, friend of a parental, or grandparental. They are Dannah Gresh's books, Six Ways to Keep the Little in Your Girl and Six Ways to Keep the Good in Your Boy. Here's one big take-away that I can offer you if you simply refuse to read parenting books, like I usually do. I'll break it down for you to one important concept. Connectedness. Stay connected with your child. Develop and feed and nurture a connection. I'm not saying be their pal and buddy. But as you parent and lead, work on connection. Family dinners. Conversations. Time together. Ask questions. Listen to answers. And stay connected. All sorts of research--secular and Biblically based-- point to the power of connection as a deterrent from drinking, drugs, and other poor choices for teenagers. Research also shows the power of connection for feeding confidence and empathy and success. So along those lines, I offer this summer manifesto. Be the house where the kids gather. Be the house to say yes to hosting the loud, rowdy, sometimes untidy children and teenagers. Just be the house. Even when it's not convenient. Here's the thing. I grew up with a mother who I think never learned this. I don't fault her for it. She grew up with a mother who saw hosting as an exhausting, elaborate, Martha Stewart performance. Complete with place cards for Christmas dinner--which included family only. You had to be married in or you weren't invited. My husband was a rare exception. Bless her heart, my Granny was an introvert. And she worked herself thin to set a fancy table and offer an extensive menu. My dad, however, grew up in a very different house. His mom is still one of the most fun people I know because she always made me feel invited, welcomed, and like I could just be myself. She is all about people and hosting them and connecting with them and being part of the party. Simple is fine. The company is most important. Deep conversation and easy laughter are her forte. My dad learned her skill and practiced them as I grew up. It's precious to me that high school friends still tell me how they remember the homemade "fill in the blank" that my dad cooked and how he made them feel welcomed. One of my most precious gifts in high school was the relationship I had with Lani, my friend Shannon's mom. Lani made everyone feel welcome as her door was always open and her hugs were offered generously. When I married my husband, we'd already had multiple conversations about being the Kool-Aid house. (For the youngsters reading this blog--that's a cultural reference to the commercials for Kool-Aid that aired when we were kids. 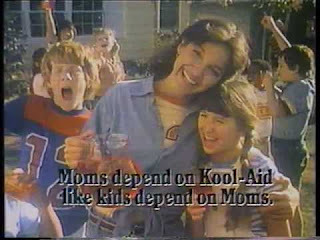 They featured one mom who hosted the neighborhood and offered the miraculous wonder that was Kool-Aid for all to enjoy). The Kool-Aid house. That's who we want to be. And we are in a critical season, we suddenly realized, when it comes to facilitating this. Because our oldest just began driving. It's been an "OH yeah!" season for us. His friends are all beginning to drive and we want them to drive HERE. To gather HERE. To be in our home. Avoiding other pitfalls in life. So, we have consciously taken some steps this year to ramp up our Kool-Aid factor. I'm summarizing my overall goal for the summer to this one phrase: be the house. I'm off to a good start. I've got a handful of high school boys in my backyard right now. Enjoying a swim and my super fancy offerings of bottled water, Popsicles, and pizza rolls. Teenage boys are easy. No place cards necessary. We've also hosted two co-ed parties for our other son this year. Which means we have been fine tuning our ability to be hovering and watchful eyes whilst trying to appear all chill and laid back. I've hosted my daughter's friends for a bi-weekly Bible study this past school year. Listen, I'm really not tooting my own horn. I've got a long way to go. This is all something that I am working on, trying to perfect and do more easily and naturally. Because truth be told, my personality leans more toward my mom and Granny than my dad and his mother. But I remember the words and wisdom of Dannah Gresh. I remember how I can recall specific conversations with Lani, the second mom to all her daughter's friends. I remember that what my friends remember most about my dad is how he made them feel. And so, I'm trying to be the house. Which means setting my agenda aside for quiet evenings or lying around watching television when my kids ask if they can host friends. Which means saying yes when my natural bent would be no. Which means budgeting for more groceries and cutting from another category. Which means making some effort. And not giving in to some pressure to be all Pinterest perfect. But just learning to be available and say, "Have whatever you can find in the fridge." Did I mention that I am a closet introvert and a recovering perfectionist? So I have to be intentional. To keep it simple. And remember that these kids don't care if there are place cards or cute paper plates. In fact, I just took a cookie sheet of pizza rolls to the boys in the backyard without so much as a plate or napkins. They are sixteen years old. It's food. They don't care. I have to remind myself that I want to be the house. I want the connection. I want the end result of being hospitable. I want to know what is going on with the kids as they tend to forget I can actually hear them in the back seat. I want to get a glimpse into the world my kids live in, as I get to know their friends more. And so far, I have to say, while I've got a ways to go...I love where we are headed. I love my kids asking if their friends can come over and stuffing my desire for a quiet evening or day and just saying, "yes." Part of trying to make our home a soft place to land for my children is making it a refuge for their friends as well. Even if that means there's extra clean up involved. So, I am trying to be the house. I want to be "the more the merrier" mom and you're always welcome here house. I want my kids to see a premium being placed on people over things or cleanliness. If that means adding popsicles, pizza rolls, and refrigerated cookie dough to the grocery list, so be it. Be the house, people. Let's be the house. For the sake of connection. For the sake of relationships. For the memories we will make along the way and the emphasis on the valuable things in this life. Because people matter. People matter most. So if you go to the grocery store and the kool-aid shelf is empty, you know who just came through.